“Batter Up” is our second treat in our “Play with your Food, A Series for Kids.” It’s another recipe for that kid friendly classic, rice krispie marshmallow treats. Batter Up treats are made to look like a baseballs but they certainly don’t taste like baseballs!! Your kids and their friends will love these treats. If fact, adults will too. Right Fred?? 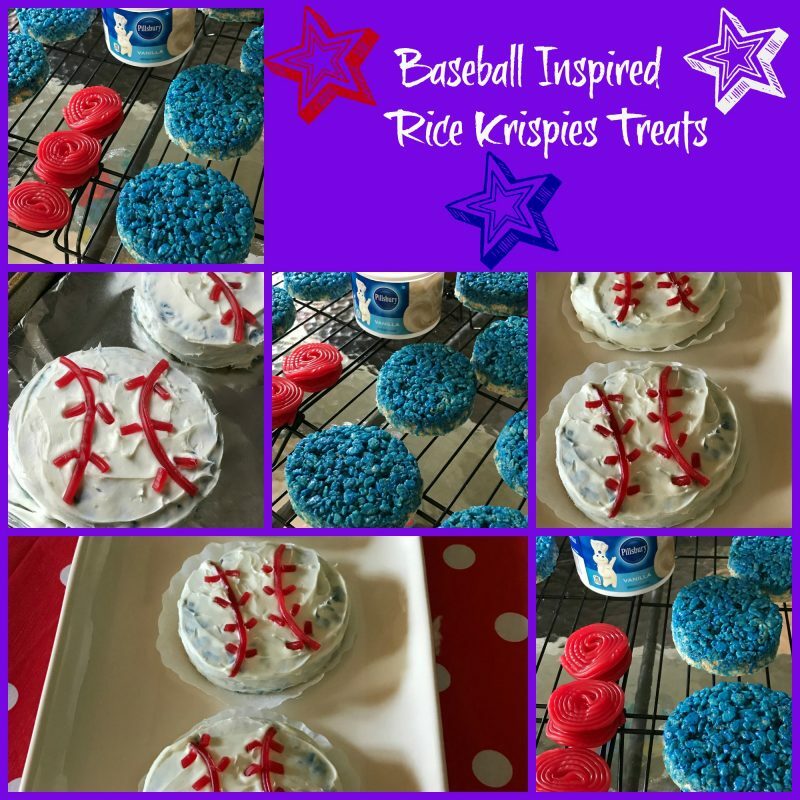 Baseball Themed Krispie Treats are perfect for “kids” of all ages. Marshmallow treats are so easy to make most people don’t even need a recipe. For these treats, simply press the marshmallow treats into a 15 x 10 x 1-inch jelly roll pan, cut out circles using a biscuit cutter or an empty clean can, such as a sauerkraut or tuna can, frost with your favorite vanilla frosting and decorate with red licorice wheels. Baseball Themed Krispie Treats are as easy as 1, 2, 3. To officially start the baseball season and to celebrate my grandson Eliotts’s first baseball game, what a better way to celebrate than with treats. Start the season off right with these cute, baseball themed crispy treats in your little or big sluggers team colors. Make a large pan of crispy treats and cut them out with a round cookie cutter, frost the top with frosting and decorate with red shoestring licorice. You’ll hit a home run with these treats! 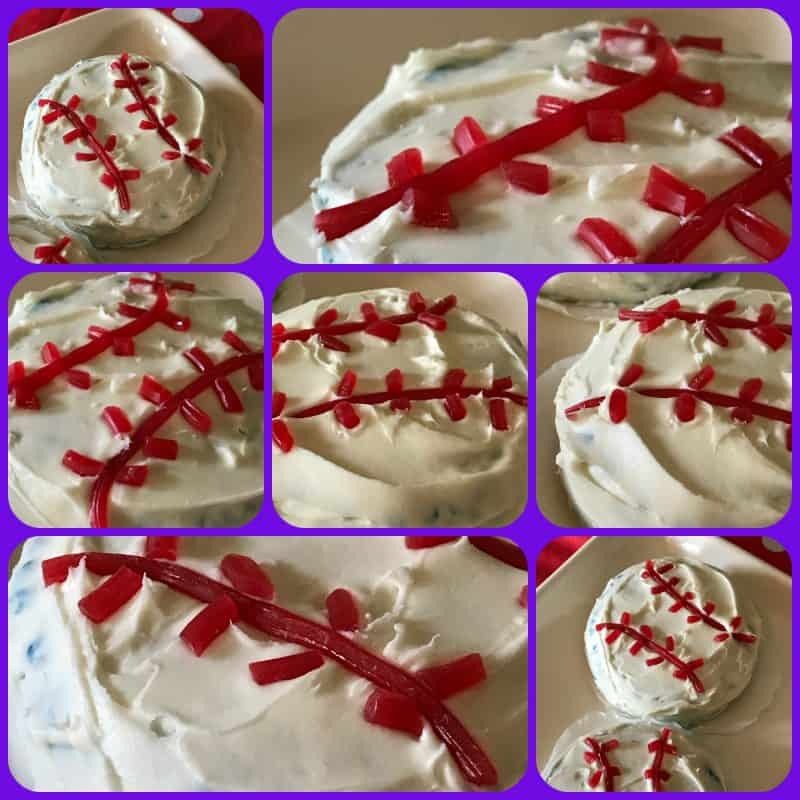 A fun treat to make your slugger. In a large saucepan melt butter and marshmallows until smooth and creamy. Add a few drops of your favorite team colors and stir. Stir in rice krispies cereal and stir until cereal is well coated. Press cereal into a lightly buttered 12 x 17 baking pan. Make Second batch of rice krispies treats. Press second batch on the top of the first batch to form layers. When completely cooled, remove treats from pan and using a rolling pin, roll pin back and forth over treats like you would if making a pie crust. Hungry for more Rice Krispie Treats?? We have a plenty more recipes for marshmallow treats. Take a look: Minion Inspired Treats, Strawberry Lemonade Krispie Treats and Watermelon Rice Krispie Treats and Red, White and Blue Krispie Treats.